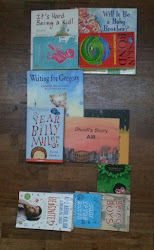 One story a day : Reliving childhood: Your Favorite book! With One Story a day completing a year, we decided to celebrate and no celebration is complete without a cake and when a cake is brought home, no matter what or who’s special occasion it is, by default, it is Abhay who always cuts the cake! 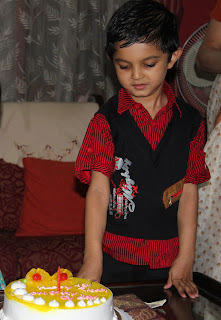 With close family and my friend Aparna with her daughter Nesara present, Abhay was glad to do the honors but wondered aloud if it is his sixth birthday already! Even so, he further probed ‘Why does the cake have only one candle’? It’s been a year since I started blogging about Abhay and though he has seen his pictures in my posts, I’m pretty sure he does not realize what it means. Anyway, it will not be long before he discovers One Story a day and find his entire horoscope featured therein …and when that happens I hope it reminds him of our favorite times together - reading our favorite books! Talking about favorite books, today I read “Charlie Cook’s Favorite book” by Julia Donaldson and Alex Scheffler. A book about a boy named Charlie Cook who curls up in a cosy chair to read his favorite books – a book about a pirate chief who unearths a treasure chest which turns out to be a treasure of books; a book about Goldilocks who lay on baby bear’s bed reading baby bear’s favorite book; a book about a knight who tames a dragon by reading out a joke from a book; a book about a frog who jumps upon a book and goes “Reddit! Reddit! Reddit!”; a book about a headless ghost who puts her head back on again to read her favorite book and finally a book about a boy named Charlie Cook himself who is engrossed in the world of his favorite books! So everyone has a favorite book – what’s yours?